Much of the UK has experienced the hottest day of the summer, with London reaching the country's high of 33C. But after a weekend of heat, cooler air is due as thunderstorms begin to spread eastwards from north Wales on Sunday afternoon, BBC forecasters said. 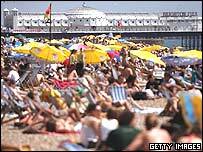 Throughout the weekend Britons have flocked to beaches and parks to enjoy the sun and cool off. The heat was widespread with East Anglia and southern parts of England and Wales enjoying high temperatures. However, BBC forecaster John Hammond said flash flooding was happening in north Wales by late afternoon, and warned of "horrendous" road conditions from the "very violent thunderstorms". North west England, Merseyside and the Pennines should expect rain as the thunderstorms head east, but London was not due to be hit, he added. The Met Office issued a severe weather warning, with heavy rain due in Herefordshire, Leicester, Leicestershire, Lincolnshire, north and north east Lincolnshire, Nottingham, Nottinghamshire, Rutland, West Midlands, Warwickshire and Worcestershire. It said some areas could experience hail and localised flooding. But for those who are finding the heat too much, Mr Hammond said the thunderstorms were bringing cooler air from the west - "so tomorrow won't be as oppressively hot as it has been today". Rain has already caused flooding in parts of Scotland. Rescuers picked up eight people trapped on an island in the River Almond at Sma'glen near Crieff, Perthshire, while landslips were reported on the island on Arran and several homes have been flooded. But many parts of the UK enjoyed higher temperatures than the Costa del Sol on Sunday. The temperature reached 28C (82.4F) in Birmingham, 27C (80.6F) in parts of south east England and Yorkshire, and 24C (75.2F) in Aberdeenshire on Saturday. However, four people died during the heatwave. A 30-year-old from Stevenage, Herts, drowned in Fairlands Valley lake, while a 35-year-old got into difficulties and disappeared while swimming in Caldecott Lake in Milton Keynes. The body of a 23-year-old man was dragged from the sea near Anstys Cove beach, Babbacombe, Devon on Sunday morning. And a 16-year-old boy died in hospital after being pulled from the River Thames at Sunbury, Surrey, on Sunday. 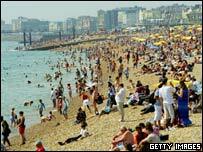 The Maritime and Coastguard Agency (MCA) had urged people at the seaside to take extra care to avoid accidents. During the heatwave of 2003, some 27,000 people across Europe died as a direct result. In the UK there were 2,000 deaths caused by the heat - 85% of which were people aged 75 and over. Health experts say it takes just two consecutive days of heatwave temperatures to have a significant effect on health.